The Apple App Store is your source for new apps that you wish to acquire and download on to your Apple device. The App Store currently has over 2 million apps. Many apps can be downloaded for FREE. Other are purchased. Some are downloaded for free but require a later purchased in order to use. This recipe will provide the steps used to download new apps. Even though your Apple devices comes pre-installed with dozens of useful apps, when you want to maximize the capabilities of your iPhone or iPad, you will likely look to install new apps. These apps are usually developed by third party developers to provide specific functions to your device. The range of capabilities of the third party apps if very wide and includes games, audio, video, navigation, education, productivity apps and more. Some of the apps are very popular but when you add up the totals, users have downloaded over 170 billion times. What are the most Popular Apps. Annually Apple publishes a list of the most popular apps. The list is too much for this recipe but a list of the most popular free apps for 2018 would include many household names including YouTube, Instagram, Snapchat, Messenger, Facebook, Netflix, Google Maps, Amazon and Uber. To download and buy apps from the App Store, you need an Apple ID. Your Apple ID is the account that you use to access Apple services. Even FREE apps require you to supply your Apple ID. 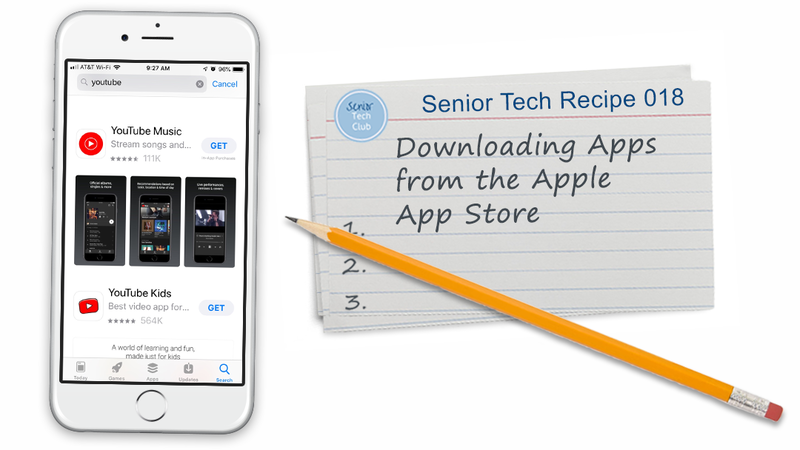 You can learn more about your Apple ID in Senior Tech Recipe #11 – Your Apple ID. In this recipe you will learn how create and change your Apple ID. Although many apps are FREE, the purchase of an app will require you to use your credit card. You can also redeem Apple gift cards in order to add funds to your Apple ID. Find the App store icon on your Home screen to launch the App Store. Here are the functions available on the App Store screen. 4 Updates – See apps that have been updated and launch the app updates. 5 Search – Tap search to find a specific app. Most useful when you know the app you want to download. Tap Search at the bottom of the App Store screen. Enter the name of the app that you want to download. Current popular trending apps are displayed. If you type YouTube, you will be presented a list of YouTube apps. Tap the one that you are seeking to display the app’s product page. On this product page, you can read about the app, see ratings and number of downloads. This information is important to help you confirm that this is the app you are seeking. Tap GET to start the download process. GET (In-App Purchases) – This app is free to download and install but additional purchases will be offered in the app. A good example is the Amazon app. Free to install but purchases are extra. Price ($3.99) – This app will require payment to install. Download – This app has already been purchased and can now be downloaded. This will occur if you delete an app from you device. You can download again without another purchase. After tapping the desired action you will be asked to confirm your Apple ID. 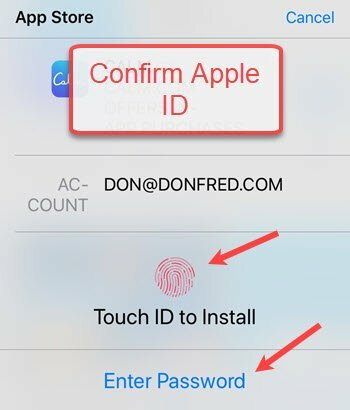 This can be done with Face ID or Touch ID if those functions are setup. Or you can enter your Apple ID password. After your Apple ID is confirmed, the download and install process will proceed. The circular indicator ring will show the status. After the installation is complete, the Action label will change to OPEN. Additionally, the app icon will be placed onto the home screen, typically in the first available location. From this point you can begin to use the app. With some apps, login or other setup will be required. What is the app the you use to install new apps. What does it mean when you see the label GET on the product page. True or False – Do you need to supply our Apple ID in order to download a Free app?